Oooooweeee, you're engaged. Congratulations, this is going to be awesome! When it comes to planning your day you have probably got naff all clue where to start. Although I haven’t yet been engaged myself, I’ve had plenty of experience in seeing couples (and my friends) panic, usually because they have so many people telling them what they should and shouldn't be doing the second they get engaged. But wedding planning doesn’t have to be that way (and I promise I'm not telling you what to do). With that said, take a moment and enjoy this! You don’t need the venue booked, outfits chosen, and everything wrapped up in a bow overnight. If you want to be in a newly engaged bubble for a while that’s perfectly ok, YOU’RE GETTING MARRIED, so take the time to celebrate that fact! Basically, get down the pub. 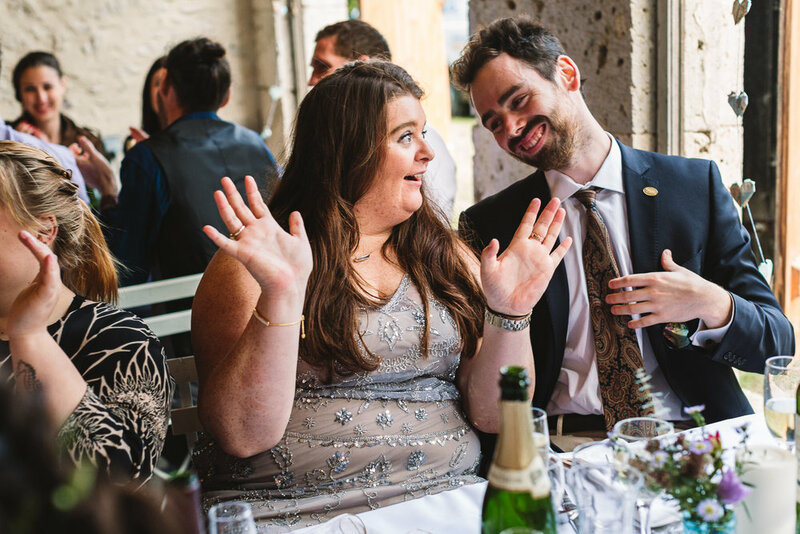 When you’re ready to come out of your prosecco induced engagement party bubble, you can start to think about the big day…and if that's right away that's cool too! Why not use some of that pre-planning time to look at a load of wonderful weddings? Check out wedding blogs that suit your style. Mr & Mrs Unique, The Unwedding Blog, and Rock and Roll Bride are just a few of the awesome alternative blogs out there that you can use for inspiration. You can also check out Pinterest, but read my blog post all about that first (if you are anything like me you'll get pin happy and totally overwhelmed). If you have a theme in mind now is the time to research it, love Space? Have a galaxy theme! Really into glitter? Go wild (I LOVE glitter and all things sparkly teehee). I also have an entire Pinterest board dedicated to Dinosaurs….just sayin’. It’s your day to celebrate exactly how you want. What kind of wedding are you planning? Something fun and relaxed, something a little untraditional? A festival wedding? Does a casual wedding in your local pub sound more appealing? Do you want a humanist ceremony? I’ve photographed total DIY weddings in fields with ceremonies conducted by friends to all in one wedding venues where on the day coordination is taken out of your hands. If you are thinking of a DIY wedding but are worried about how things will flow on the day you can always look into hiring a wedding planner for on the day coordination rather than the whole shebang! Basically, you have a ton of options. You’ve decided on what, now to decide on where. There is so much flexibility these days. If you’d rather do the legal bit with just the two of you, and then have a celebrant ceremony, just do it! Check out a few blogs for inspiration on the style of wedding that you are after. You can also use blogs to search for venues or suppliers, such as tipi hire, for those wanting to go DIY. You might have an idea on when you want to get married already. Often though, the wedding date is dictated by your preferred venue and their availability. When booking a wedding in the winter months, remember that it gets dark sooner, so I recommend starting earlier in the day. The wedding suppliers that you will need really depends on the kind of wedding you are having. You could require the services of caterers, party decorators to dress the room, florists, a bespoke cake maker, and of course, a photographer! As a photographer I tend to get booked up around 12 months in advance, so bear this in mind when searching for your fave suppliers! A budget may be boring but it’s a necessity. Once you’ve researched what you want, it’s time to work out costs. Check out this great guide on wedding budgets from Rock and Roll Bride. It’s best to include wedding insurance within your budget. No one wants to think about things going wrong, but it’s really important, when parting with so much cash, to purchase wedding insurance to keep you covered. One of my biggest tips is to make sure that you both take some time for yourselves, so that you can enjoy the planning. Try not to sweat the small stuff. As one of my couples once told me, “No one cared what colour our napkins were. They just cared about us.” That’s golden! Free wedding planning tools download from Whimiscal Wonderland Weddings here. Some of my couples swear by the Rock and Roll Bride Wedding Planner created in conjunction with one of my fave illustrators, Veronica Dearly, available to purchase here. I'm a Birmingham based photographer offering alternative documentary wedding photography. Covering Warwickshire, Worcestershire, Cotswolds and Shropshire, as well as the rest of the UK. If you are looking for fun photographer to photograph your relaxed wedding then I'd love to chat to you.